During our thorough nut and bolt restoration, we uncovered its original Medium Blue color, hidden deep beneath layers of paint. In its first life, this 1981 Land Cruiser FJ lent a valuable hand on a sugar cane farm. Its second owner, also a rancher, repainted it in Pluto Beige and used the car to commute to the city. We performed a full engine restoration, sand blasted the entire block and replaced any part needed. 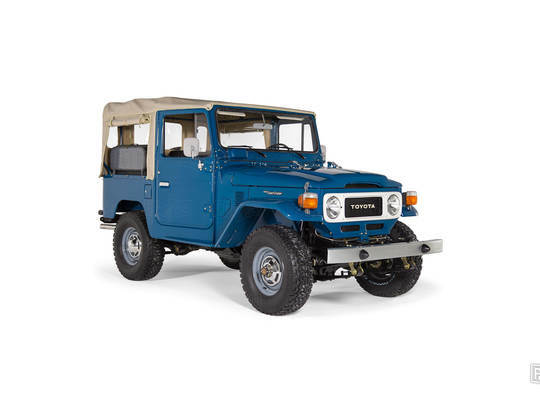 A new soft-top and top frame were installed in order to give this FJ its original look. The interior was completely restored, including new seats, floor mattress, instruments and switches. Now it looks and drives like a new car with power steering, front-disc brake system and electronic starter. Every emblem, headlight and signal light was replaced with a new, original part.